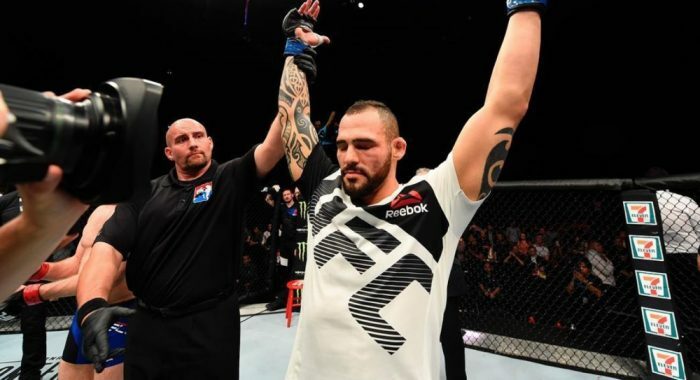 Santiago Ponzinibbio capped off the first ever UFC event in Argentina with a highlight reel knockout to finish Neil Magny in the fourth round in the main event. While the end didn’t come until nearly 20 minutes into the fight, Ponzinibbio was already well ahead after absolutely battering Magny’s lead leg throughout the first three rounds. Again and again, Ponzinibbio would target that lead leg and by the time the fourth round was underway, Magny was being chopped down like a tree while noticeably limping around the Octagon. The leg kicks nearly finished the fight but Ponzinibbio clearly wanted to put that exclamation point on his performance and that came after he trapped Magny against the cage and unleashed a vicious overhand right that connected flush. Magny immediately crumbled face first to the mat as Ponzinibbio celebrated the win in front of a home audience in Argentina. Afterwards, Magny was quick to call out welterweight champion Tyron Woodley and while it’s highly unlikely that he’ll get the fight, at least he got his attention. “This right hand will KO everyone in the division. I’m the next world champion. 2019, the belt will come to Argentina,” Ponzinibbio shouted. In the co-main event, Ricardo Lamas battered Darren Elkins for the better part of three rounds but had to stay patient while trying to put away the incredibly durable featherweight from Team Alpha Male. By the time the third round was underway, Elkins’ face was covered in blood but he was still trying to mount a comeback but he was unable to put together any meaningful offense as he was constantly fending off attacks from Lamas. Finally midway through the final round, Lamas put Elkins down on the mat, hammered him with elbows and then finished the fight a few seconds later with a couple of hammer fists that left no question as the referee rushed into stop the carnage. Newcomer Johnny Walker made quite a debut in his first appearance inside the Octagon as he flattened Khalil Rountree with a first round knockout. 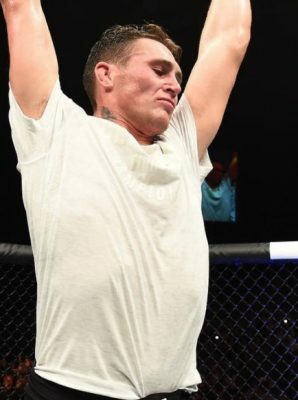 Walker, who had previously appeared on Dana White’s Tuesday Night Contender Series in Brazil, looked confident from the start of the fight and once he started getting inside to grab onto the clinch, it was the beginning of the end for Rountree. Walker ended the contest with an elbow strike from the clinch that just demolished Rountree and put him down and out as the fight game to an end in the opening round. In the opening bout on the main card, Cynthia Calvillo bounced back from her first professional loss, a long layoff due to a suspension after testing positive for marijuana and then missing weight on Friday to make short work of Poliana Botelho. Calvillo was quick to take the action to the ground and she wasted no time locking up the rear naked choke and without even securing her hooks, Botelho was not escaping and she had no choice but to tap out from the submission.